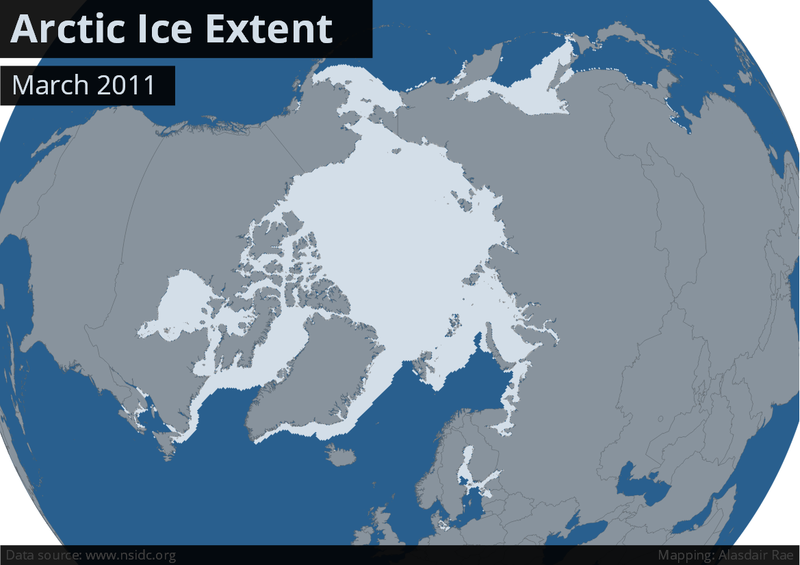 During the recent Paris climate talks, I began to think more about the topic of arctic ice melt because I really didn't know too much about it, beyond the general knowledge that it's disappearing fast. So, naturally, I decided to see what data I could get my hands on to explore it further and understand it better. I discovered that the 2015 Arctic sea ice minimum was the fourth lowest ever and that NASA's Goddard Media Center have produced some amazing visuals on it. 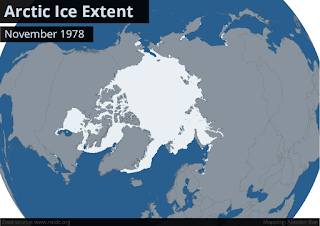 More excitingly for me, the National Snow and Ice Data Center (NSIDC) publish richly detailed data and images on sea ice, going back to 1978. This seemed like a good topic for my first post on the new blog. So, to kick off, here's the extent of Arctic sea ice in November 1978, the first month covered by the dataset (click any of the images to enlarge). The NSIDC do have their own image animation tool which is derived from monthly images, but I wanted to do my own versions which include only images from September and March - the months of minimum and maximum ice extent respectively. If at this point you're wondering how the data are derived or other questions, check out the FAQ section on the NSIDC website. If you're looking for more on sea ice in particular, check out the NSIDC sea ice news section on their website - it's a great resource. Also, to provide a little context, Arctic sea ice extent in November 2015 was just over 10 million square km - just larger than Canada. It normally peaks in mid-March at about 15 million square km and is at its minimum in September - with a mean of about 6 million square km (twice the size of India). 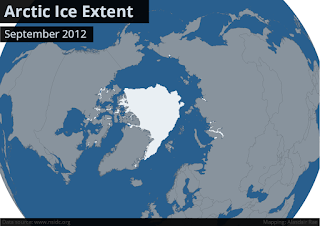 However, you'll see in the animation below that it bottomed out at only 3.4 million square km in September 2012. I've also pulled out the static image from September 2012 as it's easier to see this way. If you're planning to go all the way from the Atlantic to the Pacific in your container ship, be careful - it's not plain sailing yet, as this Washington Post story notes well. It's also really interesting to look at the month when sea ice is at its maximum extent. In March each year the ice is more than double the area compared to September, though there has been some significant variability in the minimum lately. You can see the extent of Arctic sea ice for every march from 1979 to 2015 in the animated GIF below. The data are a great resource for looking at trends, but of course not everyone is interested in trends. For example, the Daily Mail ran a story on this kind of thing in 2013, noting the growth in ice cover between August 2012 and 2013. It also grew in extent between March 2011 and March 2012 (see below) but of course this isn't consistent with the long-term trend of sea ice loss documented by NSIDC. The overall story is one of ice melt. There are so many powerful visuals on this topic, including NASA's own great small multiple showing all months from 1979 to 2014 and a recent Goddard video on the 2015 minimum. One thing I've seen less of is a single year in a simple animation, so that's what I've done below for 2014 in another animated GIF. That's all for now. I'll be returning to my normal urban data topics in future but I thought I'd kick off the new blog by doing something a little different and learning something new. In the spirit of the title of the blog (see the About section for more on that), I wanted the first post to have some 'stats, maps and pix', and this seemed like a good fit - plus I also learned something new about a phenomenon which has occurred entirely during my lifetime. Finally, here's the September and March animations again, but this time at half the speed. Data: I used data from the National Snow and Ice Data Center, which is a fantastic resource. I've barely scratched the surface of it but I now have a much better understanding of what's going on thanks to their work. Here's a direct link to the FTP directory containing the Shapefiles. The NSIDC is based at the University of Colorado in Boulder and is affiliated with the US National Oceanic and Atmospheric Administration. Software: I used QGIS 2.10 for the mapping and GIMP to create the animated GIFs. Citation: Fetterer, F., K. Knowles, W. Meier, and M. Savoie. 2002, updated daily. Sea Ice Index. Boulder, Colorado USA: National Snow and Ice Data Center. http://dx.doi.org/10.7265/N5QJ7F7W.